Los Feliz is an established hub of affluence, creativity, and bohemian sensibility. While Spanish and Mediterranean style homes dominate the housing stock the neighborhood is filled with architecturally significant structures listed as historic cultural monuments. Wright uses the same textile block system his father used in the Millard House in Pasadena. In 2001 high end house flipper Xorin Balbes purchased the property. Despite the hiss of criticism he received from architectural purist, Balbes’ restorative remodel successfully created a modern day sanctuary. Historic cultural monument no.12 was designed by Frank Lloyd Wright for oil heiress Aline Barnsdall. Known today as Barnsdall Park the Mayan-esque looking home rests at the center of Oliver Hill. Barnsdall loved Hollyhock flowers and instructed Wright to make them part of the home. Representations of the flower are seen on the roofline, wall, columns, planters and furniture. Historic monument no.149 is a testament to Frank Lloyd Wright’s innovative approach to architecture. It’s one of four Mayan-esque textile block structures designed by Frank Lloyd Wright in Los Angeles. Wright was not a fan of the “gutter rat” material but his creativity and curiosity on how to utilize the cheap concrete blocks got the best of him. The Ennis House is the fourth and largest of Wright’s textile block designs. Historic cultural monument no.23 is architect Richard Neutra’s nod to industrial production and a turning point in his career. The home was designed for health conscious physician and naturopath, Philip Lovell. It is considered to be the first steel home in the United States. This modernist residence, also known as the Lovell Health House, seamlessly blends minimal industrial details with Lovell’s desire to live in a home that breeds healthy living. The home served as a turning point in Neutra’s career. 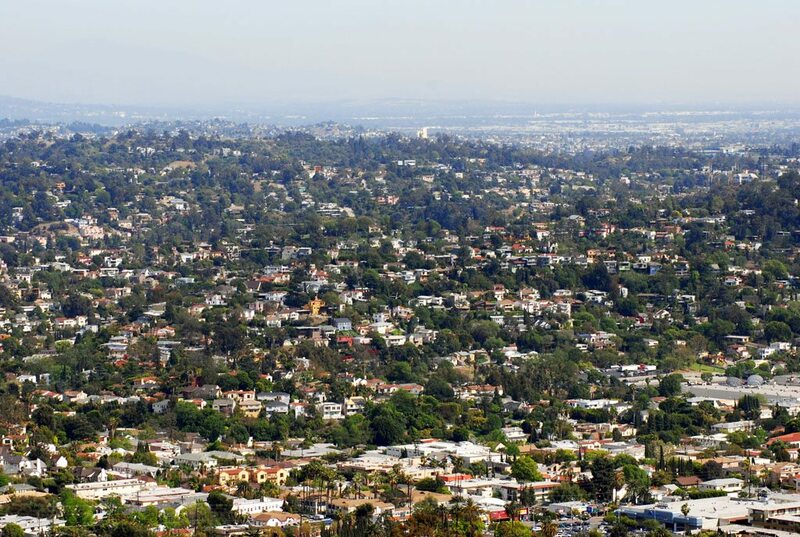 Los Feliz is considered to be highly diverse for the city of Los Angeles. Just over half of the population is white. The next largest group is Latinos making up 18.7% of the population. Asians are next at 13.5%. An unidentified group makes up 6.6% while Blacks/African Americans make up 3.7% of the population. Los Feliz offers a never-ending list of places to eat, drink, and sleep. Here are a few local faves. Los Feliz is named after its land grantee, José Vicente Feliz, whose 8,000 acre land grant included Griffith Park. At the entrance of the park stands a statue of Griffith J.Griffith, a Welshman who in the early 1880’s gained ownership of what was known then as Rancho Los Feliz. He later donated a wad of cash and over half of the area to the city of Los Angeles. The park is the largest urban park in North America. It’s filled with endless hiking and equestrian trails. Among the must see attractions are the observatory, the Greek Theatre, the Los Angeles Zoo, Travel Town, and multiple golf courses. Griffith J. Griffith believed “an individual gained an enlightened perspective when looking at the skies” and dreamed of bringing astronomy to the masses. The Observatory is a Los Angeles gem. It sits high on Mount Hollywood offering breathtaking views of the city below. To get a closer view of the LA basin and the surrounding mountains you can peek through one of the coin-operated telescopes mounted around the perimeter of the building. On clear days and nights telescopes are available inside the building for visitors to gaze in wonder at the stars. Make sure to check out one of the shows at the Samuel Oschin Planetarium. There’s no wine list. And they don’t know your name but describe how you like your wine to taste and they’ll pour you a perfect match. Co-owned by former long term resident bartender of Café Stella in Silver Lake, Dustin Lancaster, and former employee of Silver Lake Wine turned one of the top Sommeliers in the country, Mathew Kaner bonded and make the perfect hosts of this neighborhood bar. And if you are looking to host a private party, or an event, check out their private room, Sidebar. Parlaying his hospitality skills into the hotel industry, Dustin Lancaster opens Hotel Covell. With the mid century modern decor and those beautiful Herringbone hardwood floors Chapter 5 is likely to be my personal favorite. On a mission to create an artist community oil heiress Aline Barnsdall purchased 35-acres of land, hired legendary architect Frank Lloyd Wright and made plans to erect several buildings on the site. While only a few of those buildings saw the light of day, one of them is the famous Hollyhock House. Located at the corner of Hollywood and Sunset this historic landmark originally opened as a vaudeville playhouse. Now the large, single screen, movie theater provides enough leg room for a giant and the popcorn is (usually) always fresh. The zip code of Los Feliz is 90027. To the West is the Hollywood Hills. To the East is Atwater Village. Along the North is Griffith Park and to the South is Silver Lake.